A view from the cycle path: Mass cycling requires sociable side-by-side cycling which requires cyclists to take up space. Why then are cyclists the only road users expected to travel single-file? Hum, I thought that the minimum width for two way cycle paths was 3 metres. I'm going to need to look back at designs I've made to do a few updates, although widths less than 3.5 metres don't usually show anyway. I've certainly seen a lot of your examples showing 3 metres, although in general 3.5-4 metres is more normal. Normally whenever I come up with streetmix designs I first put the cycle track at 4 metres for two ways, 2.5 for one ways and cycle lanes I don't use by default at all, waiting to be proven that my idea can't use a cycle path before I resort to cycle lanes, even then they are 1.75-2.5 metres wide, 1.75 on only the narrowest of profiles and very low volume roads. I read some Dutch design manuals and already I thought that 2.9 metres was a narrow width, but to hear that the Dutch use 2.75 metre wide lanes on 80 km/h roads made me astonished, that is very narrow by the standards I've generally seen, although then again, if I have a 3.5 metre wide lane or wider, I almost can't help but go 130 km/h in the countryside motorways and 70 km/h in the urban area or faster just because I don't even notice my speed creeping up. Cruise control to the rescue I suppose. I guess the narrower profiles are doing good to make it more possible to squeeze in designs, I've had to make many profiles narrower than 3 metres to fit in cycleways. 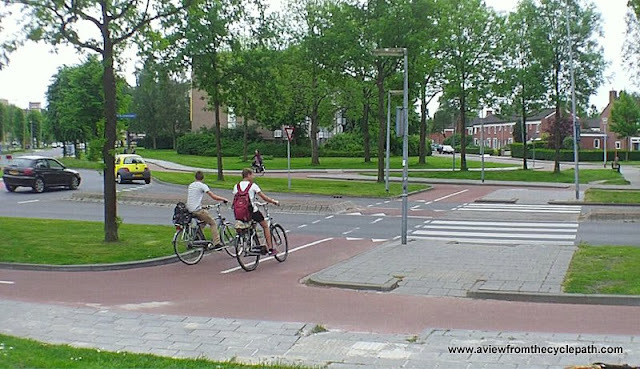 What are the widths suggested for when you either have that optical narrowing or an unmarked road, all I've heard is that one should use 3.5 metre wide widths for one way fietsstraaten that also serve as ventwegen? Robert: 3 m wide bidi cycle-paths are not uncommon in the Netherlands. It's the minimum allowed width, but unfortunately not actually wide enough. 3.5 m wide and above are far more comfortable to use. 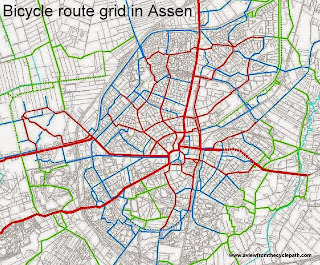 I always demonstrate this problem to study tour participants because while at a first glance to many overseas visitors everything in the Netherlands connected with bicycles looks like some kind of science-fiction, there are things which are not well thought through or inadequate here. Three metre wide bidirectional cycle-paths are amongst those things. For the sake of a few centimetres of asphalt, 3 m wide cycle-paths are irritating to cyclists. Cycle paths also need to be wide to accommodate cyclists playing Pokemon Go so that they can wobble all over the place in relative safety, that people coming the other way have a reasonable hope of avoiding them, and that when they do lose control of the bike, at worst they crash into a ditch or some grass. Inspired by this post, I created a video demonstrating the best South Florida has to offer. Mind you, this is far from typical but we enjoy this route at least once a week year-round. Nice topic. As a Dutchman I often refer interested people to your website. My German and American friends think that the Netherlands is hostile to motorists, just because there is so much focus on cycling. Of course it´s not, but somehow car friendly and bike friendly do not go together in the heads of many people. 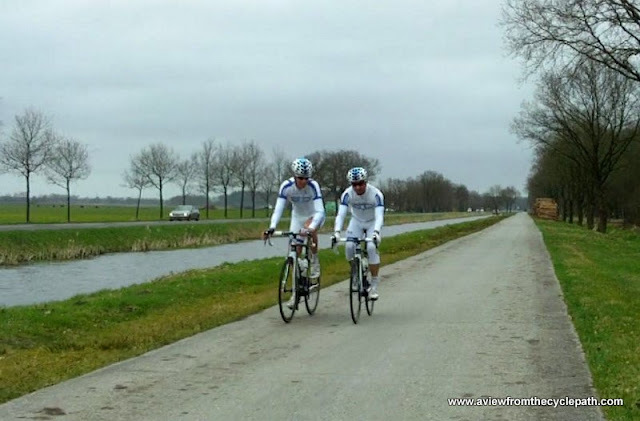 I am writing this in the last night of a 2 week cycling tour of Belgium and Holland. We (my wife and me) always try to ride side by side (even in the UK). 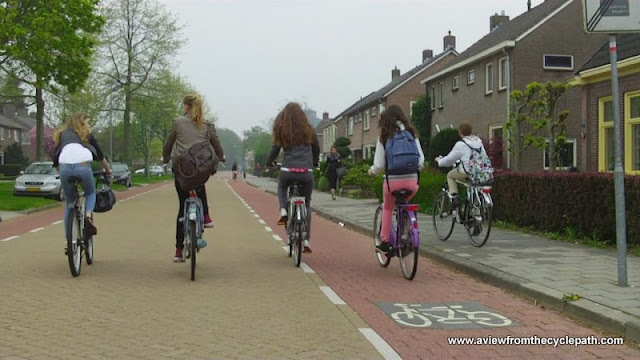 We tried to stick to bike paths and knooppunt trails and although side by side cycling is possible, it is nowhere universal in Holland as you imply. Either the path isn't wide enough, or it is not separated from motor traffic or it's simply too congested with other cyclists (usually in a greater hurry than us tourists). Still very enjoyable but no nirvana. Finch: The Netherlands certainly isn't hostile to drivers. Driving is much easier here than in many international cities. For example, commuting by car in Amsterdam is rated as more or less equivalent to Los Angeles or Berlin. But cycling is far more pleasant here than in those cities, and it's the carrot not the stick which makes people change their behaviour. 2. The knooppuntennetwerk is not a guide to good cycling infrastructure. 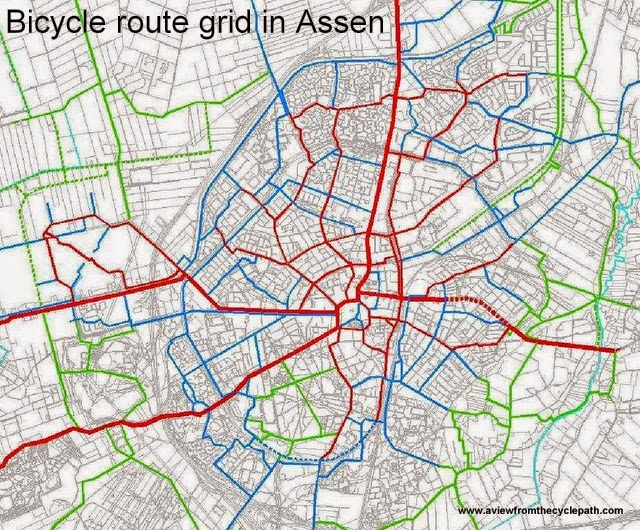 In fact you will have been avoiding the best cycling infrastructure by following those routes. They're designed for meandering around in the countryside passing "pretty" areas, not to take you on the direct and most efficient paths. Follow those routes and you'll ride on narrow and roughly surfaced single-track as often as on anything decent because that is what the knooppuntennetwerk is for. 3. This blog post is showing what should happen. I never said anything was universal. Go back and read through the post above and you'll see at least three examples which I demonstrate are not good enough. I am not an apologist for poor infrastructure. Actually one long running theme of this blog is things which are good enough in the Netherlands and I also strongly advise that people should not copy anything merely because it is "Dutch" (note that that article includes the problem of people expressing opinions based on misconceptions gained on holiday). 4. If you were mainly cycling in the south of the Netherlands, you were probably riding in areas in which the infrastructure isn't as good on average as up here in the North. We live in and work in this part of the country precisely for that reason. We use infrastructure at this end of the country on our study tours because this is where the best examples are found. David, Thank you for this very interesting blog. I have been using a bicycle as my principal means of transport for many years. I'm based in France at Divonne-les-Bains where the facilities for biking are very slowly improving. I'm continuing my campaign.